Ebstein's anomaly was diagnosed in a fetus at 24 weeks of gestation [Video 1]. The cardiothoracic ratio was 70% [Figure 1]. The functional right ventricle (RV) was small with a large atrialized chamber. 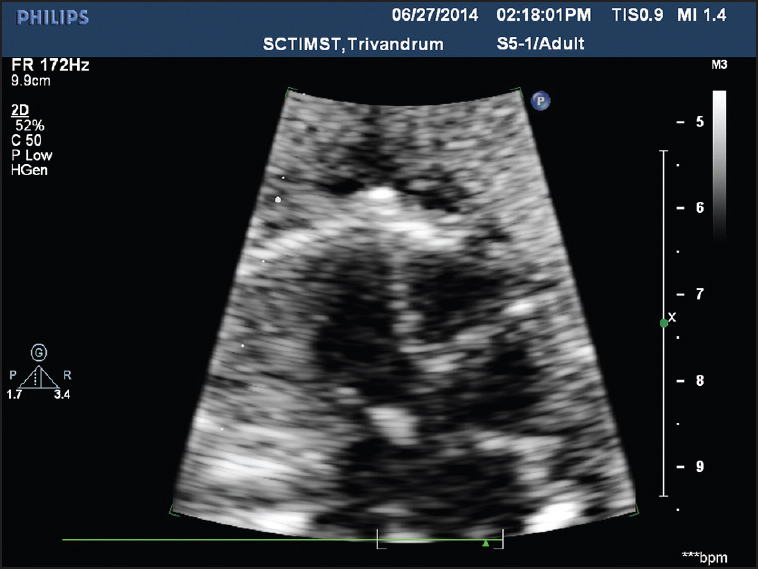 Tricuspid regurgitation (TR) was severe. The pulmonary valve annulus was well-formed, but leaflets were thickened. There was no antegrade flow across the pulmonary valve. There was flow reversal in the ductus arteriosus which was regurgitating into functional RV (pulmonary regurgitation) [Figure 2] and [Video 2]. The severe pulmonary regurgitation (PR) was causing a circular shunt where the blood was flowing back from the pulmonary artery to the RV, from the RV to the right atrium due to the significant TR, and from the right atrium to the left atrium through the patent foramen ovale (PFO) [Video 3]. Continuous wave Doppler across the right ventricular outflow demonstrated both systolic and diastolic PR [Figure 3]. There was no fetal hydrops [Figure 4]. 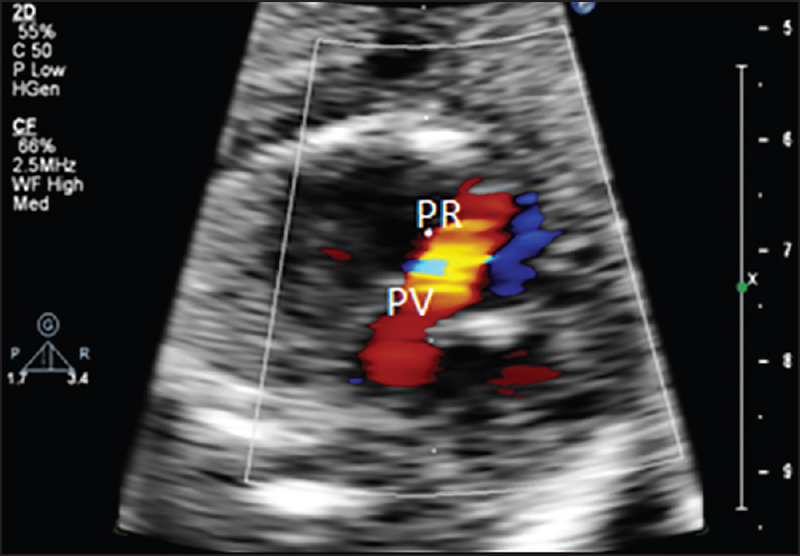 Functional pulmonary atresia and severe PR has been noted in severe fetal Ebstein anomaly, but the hemodynamic consequences of circular shunt in utero has not been well-studied. Since the pulmonary vascular resistance is high in the fetus, circular shunt may not cause systemic steal in utero, but it can lead to ventricular volume load and heart failure. Neonatal Ebsteins anomaly with PR causing systemic steal has been managed with pulmonary vasodilators to reduce pulmonary vascular resistance. Cautious use of prostaglandin E1 (PGE1) is advised as it can increase pulmonary artery pressure and worsen PR and TR and worsen heart failure. Ductal ligation  and main pulmonary artery ligation with placement of aortopulmonary shunt is an option for the sickest newborns who fail medical management. There is no consensus for the treatment of fetal Ebstein with PR. For our patient, we planned watchful expectancy with early termination of pregnancy if hydrops develops. Nature of the disease and prognosis were explained to the parents and advised follow-up scan for which they did not attend. Shone JD, Anderson RC, Elliott LP, Amplatz K, Lillehei CW, Edwards JE. Clinical pathologic conference. Am Heart J 1962;64:547. Jue KL, Noren G, Edwards JE. Pulmonary atresia with left ventricular-right atrial communication: Basis for circular shunt. Thorax 1966;21:83-90. 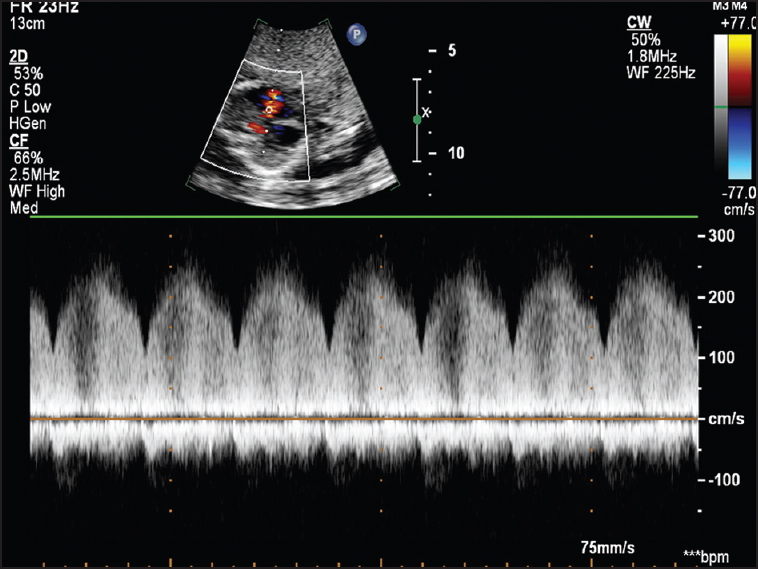 Paranon S, Acar P. Ebstein's anomaly of the tricuspid valve: From fetus to adult. Heart 2008;94:237-43. Celermajer DS, Bull C, Till JA, Cullen S, Vassillikos VP, Sullivan ID, et al. Ebstein's anomaly: Presentation and outcome from fetus to adult. J Am Coll Cardiol 1994;23:170-6. 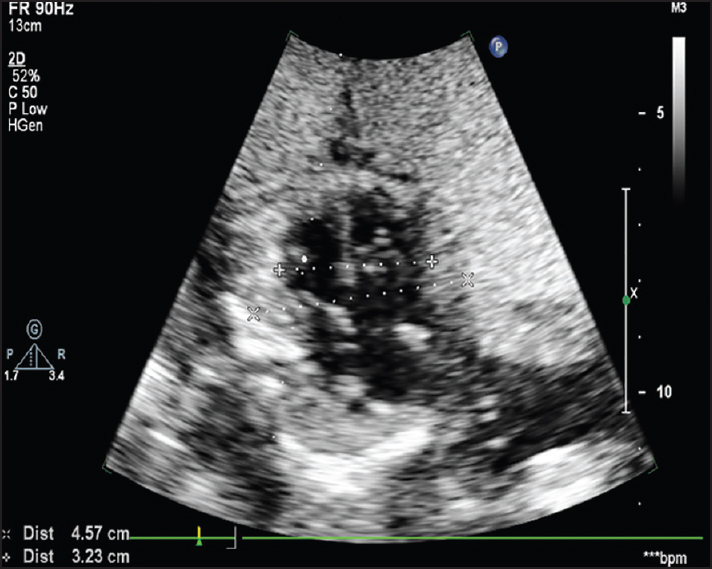 Barre E, Durand I, Hazelzet T, David N. Ebstein's anomaly and tricuspid valve dysplasia: Prognosis after diagnosis in utero. Pediatr Cardiol 2012;33:1391-6.